Our School Councillors can be easily spotted in school. They all wear a blue sweatshirt with our school logo. These children were voted by their peers because they are considered to be good role models and a good voice for each child in their class. 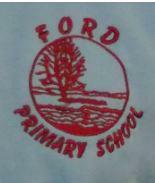 At Ford Primary School we feel it is important that the children have a say in how their school is run. This is why we have a school council to allow the children to have a voice. Our school council is made up of representatives from each class in order to ensure our school council represents our whole school. During our school council meetings we discuss many matters from issues in the school, fundraising and ways to improve our school.